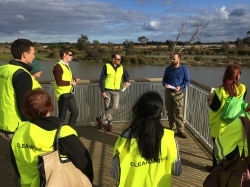 In partnership with DELWP, Clearwater will be delivering a range of initiatives across Victoria to support the IWM Forums and collaborative approaches to integrated place-based planning. We recognise that there are already a number of fantastic examples of IWM across regional Victoria that would provide valuable opportunities for knowledge transfer across disciplines, organisations and regional boundaries, and we would like offer the opportunity to showcase these projects through regional bus trips and/or site visits. To help deliver these events, Clearwater is looking for regional champions who are interested in promoting initiatives across their region, and recognise the value in bringing stakeholders together to share knowledge, insights and challenges. Working with Clearwater, regional champions will be asked to inform the design of the day by identifying potential sites and speakers, and preparing a draft run sheet. Clearwater will then manage all logistics, including transport, catering and registration. The aims of this initiative are to recognise the existing leadership across Victoria and those already driving positive outcomes for IWM, to provide a platform for knowledge sharing by discussing what worked and what didn’t, and to strengthen networks and promote future opportunities for collaboration. There is no predetermined format for these events. The activities could include a dedicated site visit that offers significant opportunities to share lessons in IWM delivery or a series of visits, each highlighting a range of project insights. To ensure interest in attendance and participation, it’s important the chosen sites offer relevance for a variety of stakeholders. This relevance could be to those working within your region and/or to those working across Victoria that share similar challenges. The ideal number of participants would be approximately 20 people. To enable travel time for regional stakeholders, it is suggested that days start no earlier than 9.30am and run for no longer than five hours. If a bus trip is the preferred option, Clearwater will arrange the hire of a mini-bus with approximately 24 seats. If you would like Clearwater to help you with logistics for your bus trip / site visit, send your proposal to Petra Katona. Please note that Clearwater has finite resources, submitting your proposal does not automatically mean that Clearwater will be able to support your event.